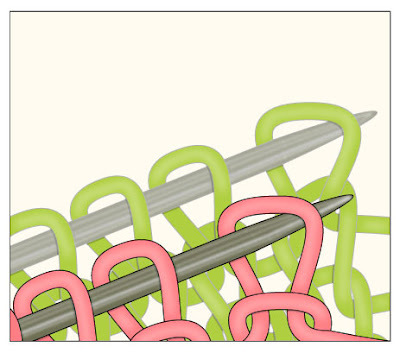 Way back in May 2007, TECHknitting had a post on the two types of sewing needles: blunt pointed and sharp pointed. The point (ha!) was that each kind has a different use. Blunt points are best for such tasks as weaving, where you don't want to split the plies of the underlying yarn. Sharp points work well for splitting plies, good for such jobs as skimming in ends. Although each type is good at what it does, the truth is that it can get rather tiresome having to switch back and forth, for example: first threading to a blunt point for weaving in an end, then rethreading to a sharp point to skim in the last nub of the tail. The temptation is to skimp and just muddle through with whatever kind of needle comes to hand first. > in those places you need the blunt point. > Just be careful not to stab yourself. What a swell idea! No more muddling, no more skimping! Using a sharp needle backwards: really very clever! (And I will try not to stab myself.) Thanks, Patti. Dear readers: you are amazing. Wow. There have already been more responses than I can keep up with--so thank you very much. I'll leave this up for reference, but with the text crossed out. Hopefully, the pattern will soon be available, if the test knits work out. 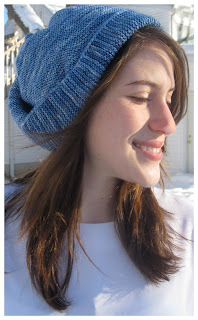 ADDENDUM Feb 2012: The pattern has been test knit and is now available. Lately, more patterns have been generated here at chezTECH. The latest of these is a ladies' cap called "Spice Road." It's a pretty neat pattern: it's knit flat in stockinette, all in one piece, utilizing a lot of short rows. Then, the fabric is folded, welted, seamed. I named it that after the fabled spice road of old, because it has three design features found in central Asian headgear: a wide smooth expanse over the brow, a little brim which runs around the top, and a turban-like fold in the back. 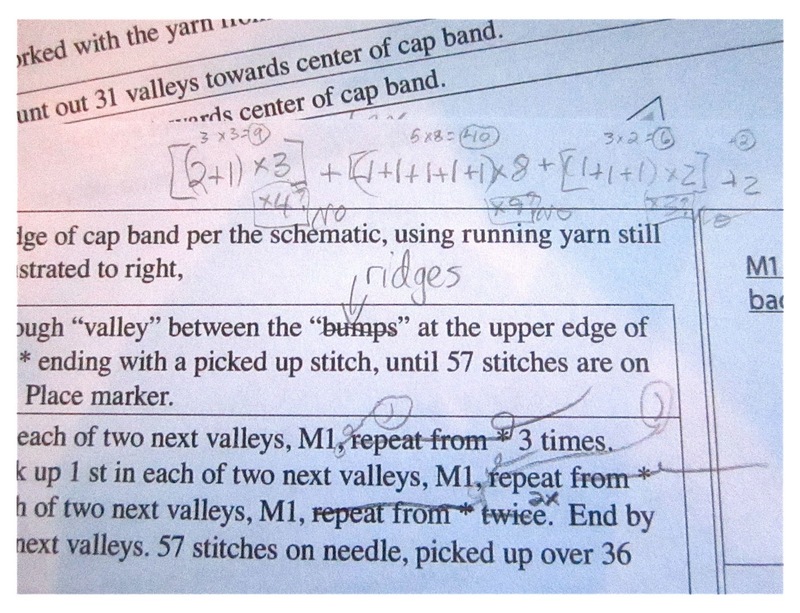 One problem is making sure TECHknitting patterns are correct. Lately, I've been doing all the test knitting myself. Yet, this is not a great idea. Because I know how the item ought to come out, I'm afraid I'd gloss over any error in the pattern. Spice Road is, I think, ready for release, but I wonder if any my lovely TECHknitting readers out there would consider test knitting it first? The pattern is designed for intermediate knitters and above (but a bold advanced beginner could probably manage). Here's the deal: It would be great to have a three (or so) test knits. 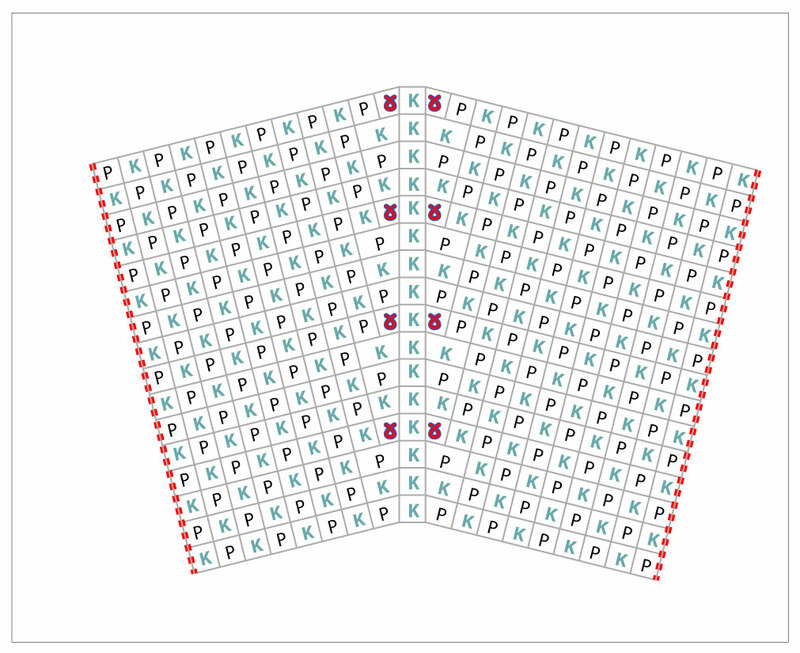 So, to those volunteers, I'll send the pattern as a PDF. You buy the yarn or use up stash, and knit the cap by January 31, 2012. Once you've gotten back to me with your comments, and once the cap is posted as a project on your Ravelry page, I will send you a $25.00 honorarium. This will hopefully cover your yarn cost. $25.00 for test knitting isn't a lot, and in an ideal world, it would be more, for sure. However, in this non-ideal world, any money from the sale of the Spice Road cap pattern over and above the honoraria is instead slated to go towards snowpants, socks, boots and science club funds, all of which the local schools around here are finding in precious short supply. Tech details: a single 100 gram skein of worsted weight yarn will suffice. Common yarns in this weight include Cascade 220, Wool of the Andes, Northampton Valley Yarn, Pattons Classic wool, and the like. The cap would best be made in wool--synthetics, especially "soft" synthetics, may not have the body required for the details of this cap to work out. The gauge is 5 st/in, 7 rows/in, pretty standard for this weight of yarn. A circular needle 22" or longer is required for knitting stockinette back and forth at the required gauge (there are possibly too many sts on the needle at one time for a single-pointed needle to work). A 16" circular needle a size smaller is also required, as is a crochet hook of size proportional to the yarn. A steam iron will be handy for blocking. Bottom line: if you are an intermediate knitter or above, if you are interested in being a test knitter for Spice Road ladies' cap, and if you can can afford to do so under these terms, write to me at the e-mail address under "profile," at the top of the right side bar. We'll work out the details to our mutual satisfaction, and then I'll send you the PDF pattern. And for everyone else, if the test knits work out, the pattern for the Spice Road cap will be for sale: this winter, hopefully. 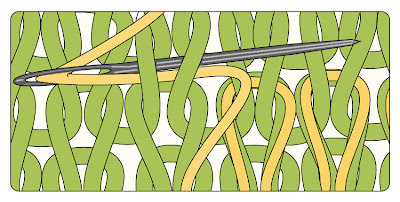 instead of drawing the running yarn through the one live stitch, you instead hold two pieces of fabric together and draw the running yarn through two live stitches: one from each fabric. working in this manner not only binds off both fabrics, but also connects them, thus creating a seam. Each fabric is worked to the very top, then held with the live loops of the last row on its own needle. Next, the fabrics are held together, front-to-front. 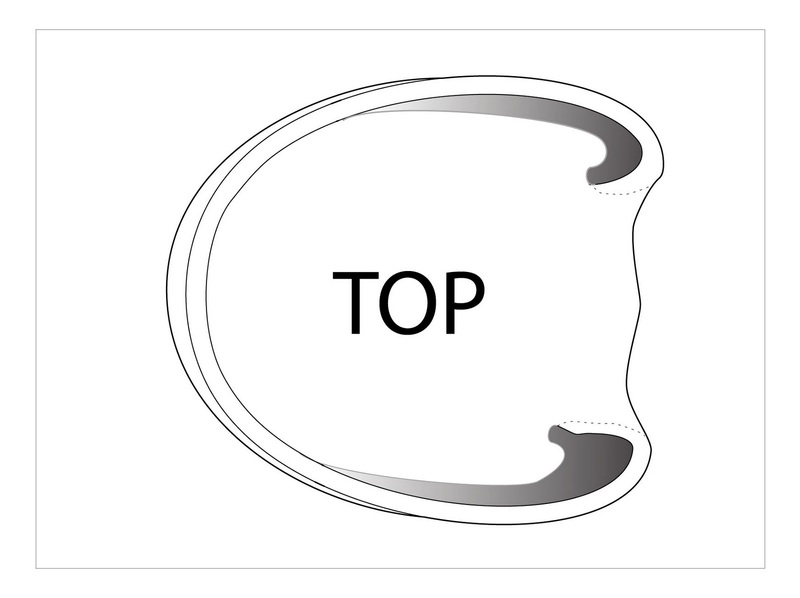 This orientation puts the seam you are creating on the inside of the garment. 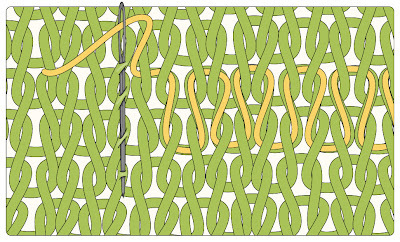 In the below illustration, both fabrics to be connected are knit in stockinette, and the knit side of the fabric is meant to be seen when the garment is worn. Accordingly, both fabrics are being held with their purl sides facing outwards, which means that their knit sides are rubbing against one another as the fabrics are being held front-to-front. From the position of the knitter doing the seaming, the red fabric held in front shows its purl side, while the green fabric held behind shows the knit face--its purl face is showing outside on the back of the work. When the seam is finished, the fabric will be flipped open so that both knit sides show while the purl sides (and the seam) will be hidden inside the garment. 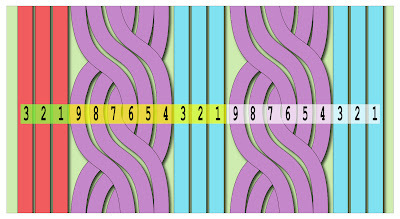 This trick is called the "three needle bind off" because, besides the two needles acting as holders for the live loops at the top of each fabric, a third needle does the actual work, as shown below. Specifically, the third needle (silver) is inserted into BOTH first loops of the two fabrics. You can see that the insertion is from front to back in the same way you'd insert if you were going to knit the next stitch. The yarn doing the actual bind off--shown in blue--can be either a scrap of loose yarn, or the tail from one of the fabrics being seamed and bound off. 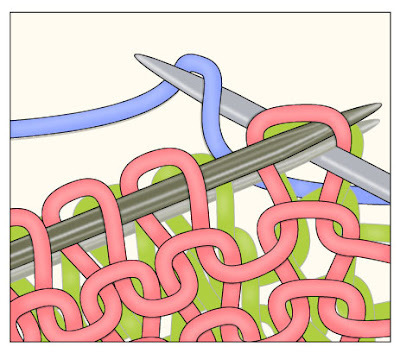 Using the third needle, the blue yarn is knit through both first loops, and both first loops just knit are dropped off. Next, the third needle is again inserted into two loops, another stitch is knit with the blue yarn, and again, the two loops just knit are dropped off. 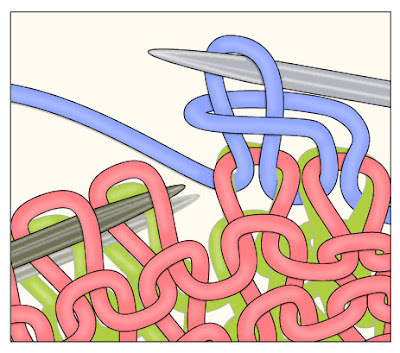 The below illustration shows two blue loops drawn through, as they rest on the working (right) needle, waiting for the bind off step. 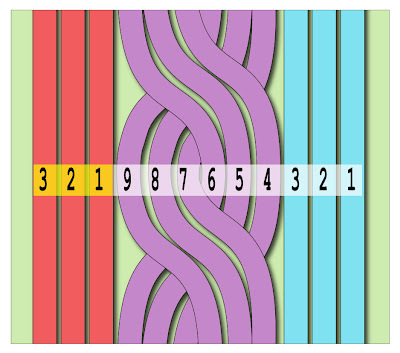 As you see, the blue loops pass through the top loops of both the red and the green fabric. The last step is to pass the first blue loop over the second. This is done exactly as for the chain bind off discussed earlier. 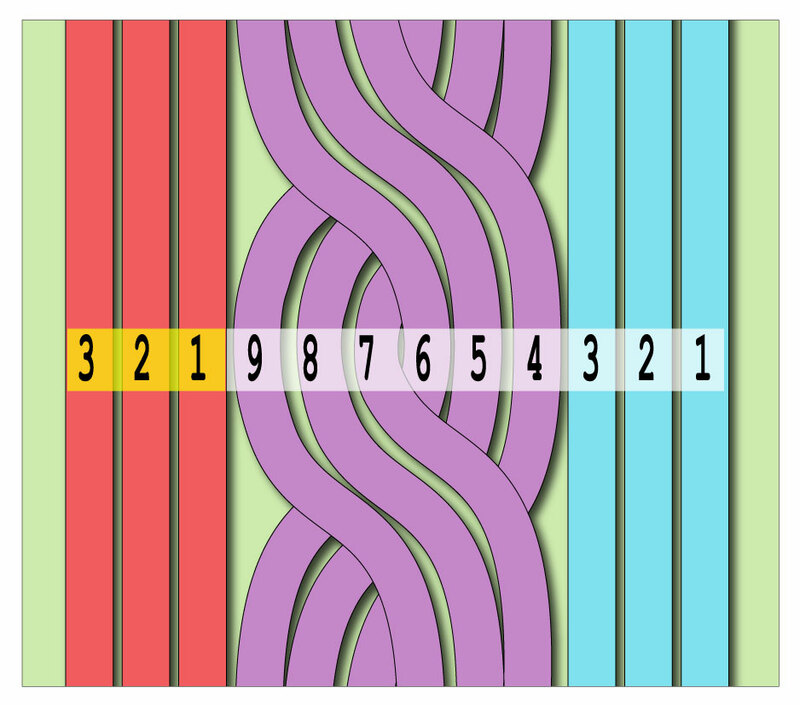 Note that at any point in the process, there will always either be two loops on the right needle, which happens when the first loop is waiting to be drawn over the second, or there will be one loop on the right needle when, as below, the first loop has already been drawn over the second. For a final illustration, here is an actual photo of a partially finished three-needle bind off, "in the wool." The two shiny holder needles are being held upright, out of the way. The third--the grey working needle--has already been poked through the front (red) as well as the back (green) fabric, getting ready to catch up the next blue loop. Showing to the right is the blue chain of the seam being formed as the fabric-tops are chain bound off together. 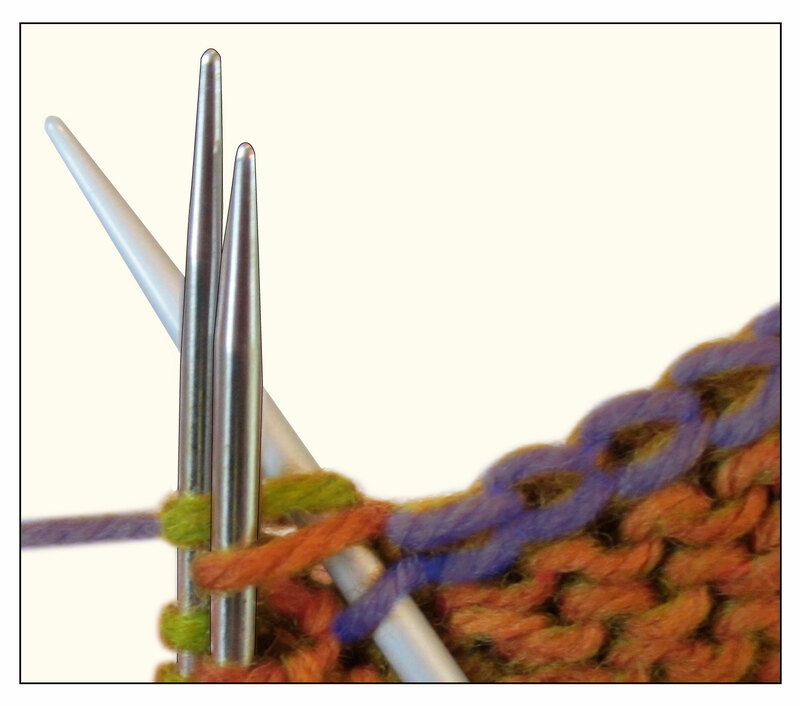 To work the seam to completion, you would repeatedly work the insertion, the drawing up and the passing over, all the way to the end of the holder needles. At the last stitch, cut the blue yarn, leaving a tail at least several inches long. 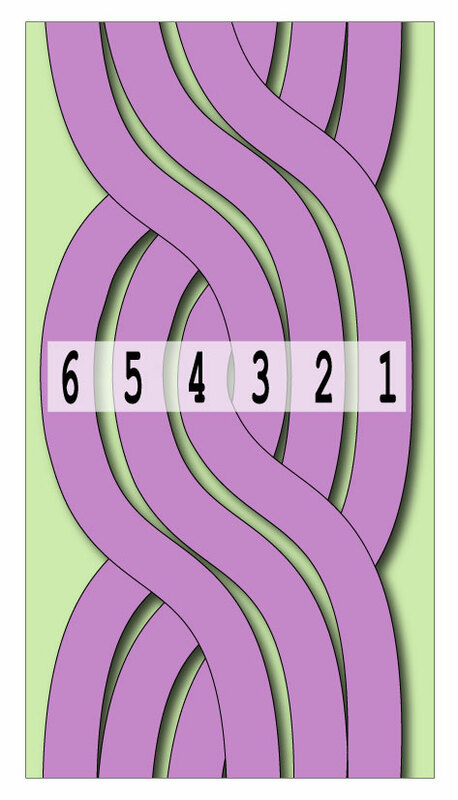 Draw this tail through the last loops as is done for chain bind off (scroll to the bottom of the chain bind off post for several different methods). Then work in the tail. Three needle bind off is often recommended for shoulder seams, but it can be used anywhere that two lines of live loops come together and require a sturdy seam to connect them. get rid of an extra stitch of by passing it over a neighboring stitch while the stitches are still on the holder needle. With this second option, you are reducing the count so that equal numbers of stitches will be on both needles before seaming. TECHknitting blog published a post on three needle bind off. Unfortunately, I skipped a brain gear and wrote the directions BACKWARDS which I did not realize until an alert reader commented. If you read the original post, please erase your memory banks and go to this corrected post, instead. Пожалуйста, прекратите воровство моего иллюстраций. вставить мои картинки в свой собственный текст. 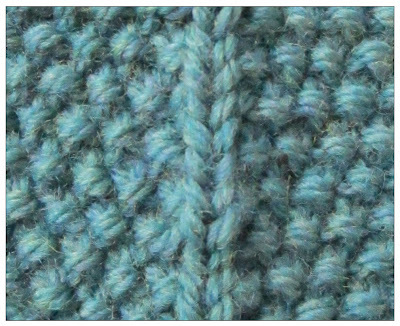 Seed stitch (sometimes called moss stitch) is a stitch pattern which arranges knits and purls checkerboard-fashion so that every purl is surrounded by 4 knits, and every knit by 4 purls. 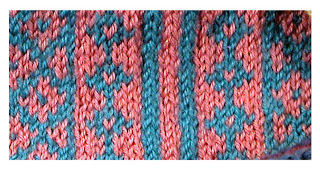 Increasing and decreasing in a very regular stitch pattern like this is disruptive, and several recent e-mails to TECHknitting blog have asked how to do this smoothly. No doubt there are several different methods, but my own little trick is to run a single column of knits, and increase or decrease along that line. Stated otherwise, pushing the stitch pattern discontinuity up against a continuous column of knit stitches smooths and hides the irregularity. 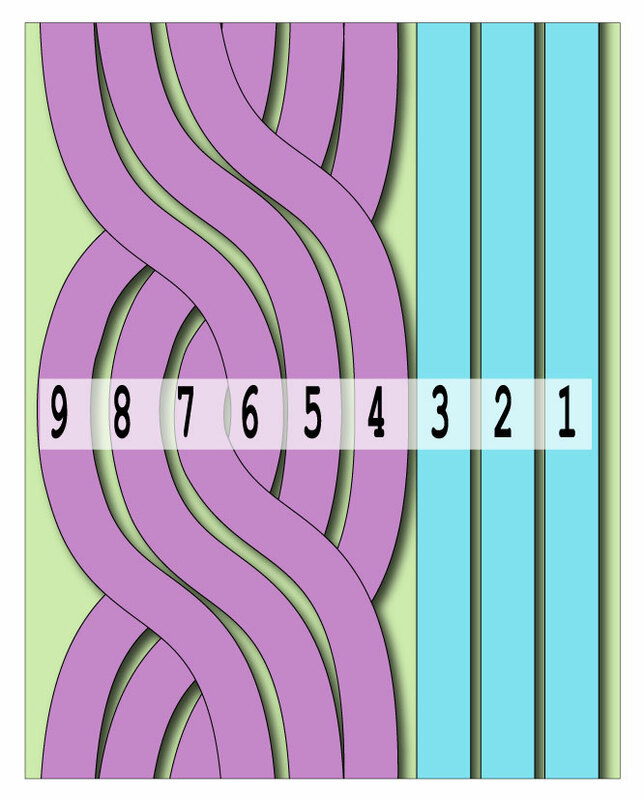 Here is a schematic of what this would look like when knitting circularly, with the increase running along a single increase line, as it might be for a sleeve knit in the round. In the above schematic, the work is laid flat so you can see it, but in the real world, this sleeve will have been knit into a continuous spiral--a cone-shape, open at the bottom. You have to use your imagination to "zip it shut" into a circle, along the red dotted lines. 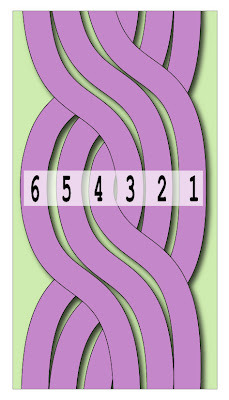 In other words, for a circularly-knit sleeve, you would actually have knit this around and around, connected at the dotted lines. The continuous column of knits running down the schematic center is actually the sleeve underarm "seam." Below is a photo of what an increase along a center line for an underarm looks like "in the wool." along the center line, "in the wool"
The little red loops stand for the increases, and you can use any kind of increases you like. 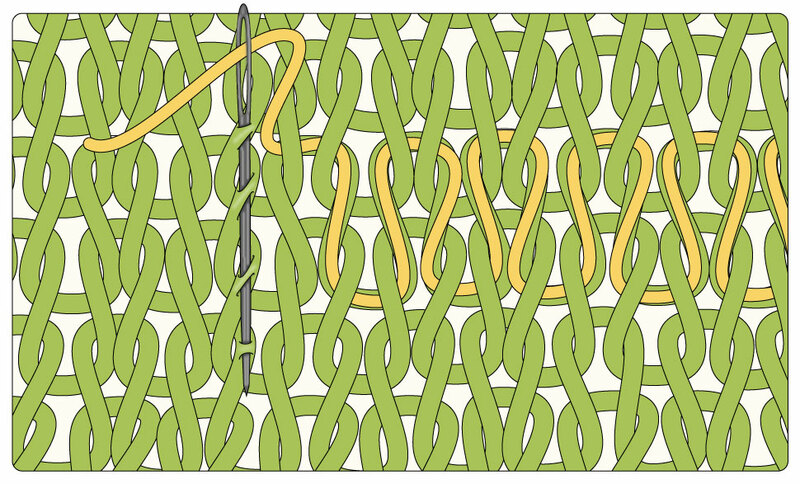 I personally use backwards loops slanting in different directions, as detailed here, but many kinds of increases will give a perfectly lovely result, such as kfb (knit front and back) or the nearly invisible increase. Using a yo (yarn over) will result in holes, however, so yo's are not a great choice. This all sounds very simple, and ultimately it is, but a lot of confusion typically surrounds increasing in pattern, so let's run through increasing one more time, in more detail, OK? The surprising fact is that when you come to make the increases, you can just make whatever kinds of increases you prefer, not worrying about whether the stitch to which the increase gives rise is ultimately going to be a knit or a purl. That's right--when you make the increases, you just make them however you like. Only on the FOLLOWING row do you have to worry about working that increased stitch as a knit or a purl, according to the checkerboard pattern established by the surrounding stitches. Stated otherwise, a loop added to the fabric in the form of an added stitch does not take on the character of a knit or a purl until it is worked on the FOLLOWING row. (If you are curious why this should be, a fuller explanation about this particular mystery of knitting is found in this post.) So the bottom line is, just make a pair of increases, and on the row or round after the increase, then work those new stitches as whatever they ought to be (whether knit or purl) as required to keep the checkerboard pattern going. 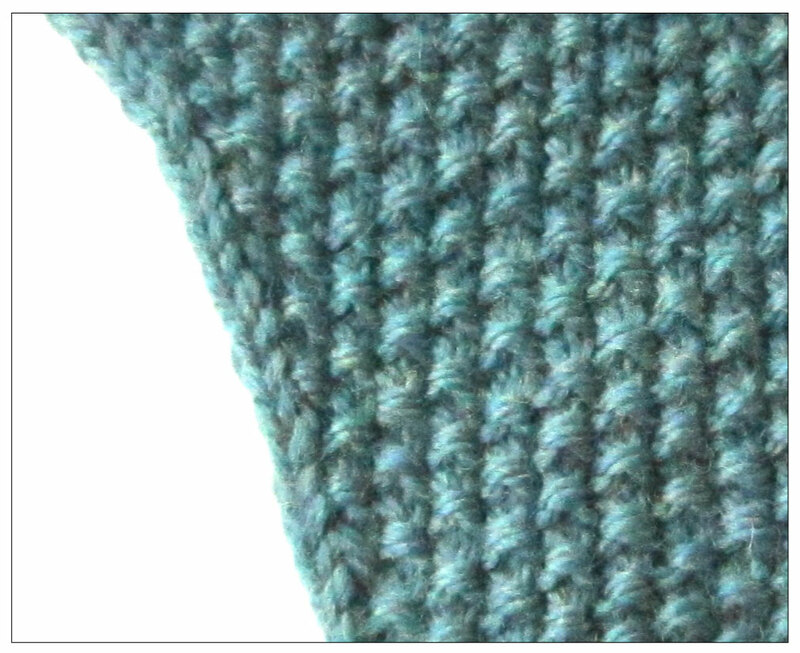 So far, we've shown the trick of increasing along a center line, such as would occur in circular knitting of a sleeve. However, many patterns call for seed stitch to be worked flat (back-and-forth). Here is what the trick looks like when knitting flat (back-and-forth) and the increase is along the outer edges, instead of down the middle. Above is the schematic, and below is the final result "in the wool." The seam (red dotted lines) has not yet been sewn shut, and the sleeve is laying flat. 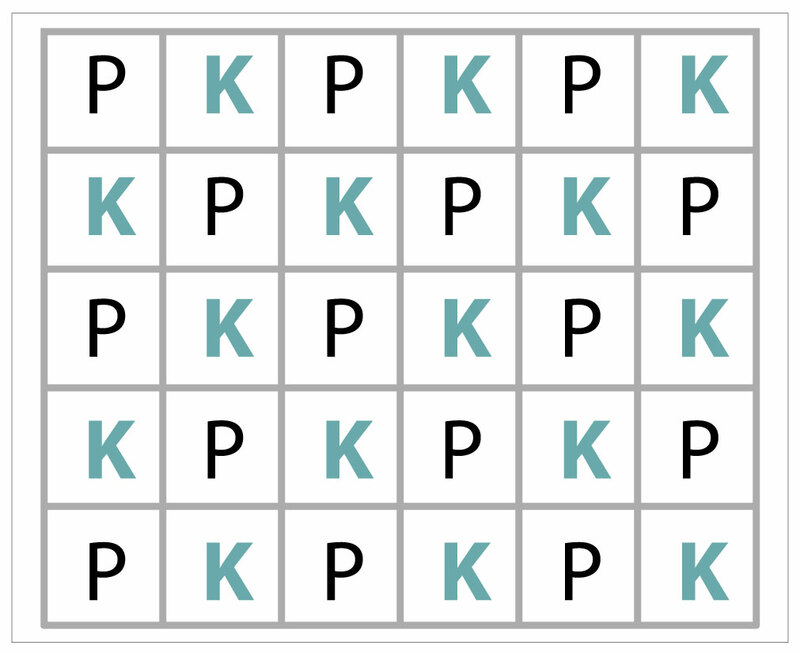 along the edges, "in the wool"
In both situations illustrated in this post, I tried to cram lots of increases into a small sample, so the increases are worked every fourth row. 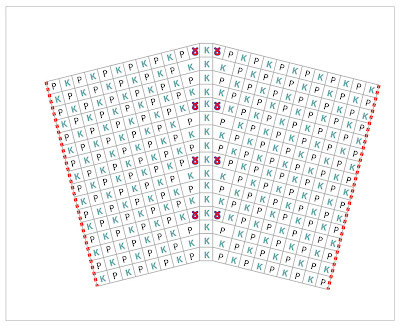 However, an increase every 6th or 8th row might be more common for a sleeve, for example. Nevertheless, although the RATE may differ, the METHOD remains the same. 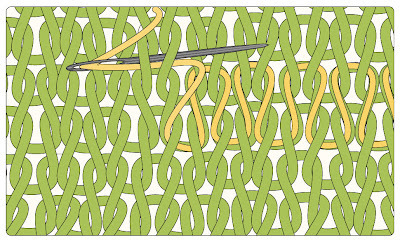 Just work your increases on either side of a center line (if working circular) or one stitch in from the edge line (if working back-and-forth), at the rate required. Then, on the NEXT row, worry about whether the increased stitch should be worked as a knit or a purl, according to the seed stitch pattern established by the surrounding stitches. I have chosen to have a single center column of knits, or a single column of knits along the fabric edge. There is nothing to stop you from running two or three or more columns of knits, instead. In fact, for a situation where there will be seaming, remember that the edge stitches might be completely consumed in the seaming process, so an extra knit column along each outer edge might come in very handy. Consider all this ahead of time, and adjust the stitch count, if necessary, so as to allow for the all-knit column(s) as well as to provide an odd or even number of stitches, as circumstances dictate, so that the stitch pattern is uninterrupted. All of the above relates to INCREASING in seed stitch, as might occur in a sleeve started at the bottom increasing from wrist diameter to shoulder diameter. Sometimes, however, you might be working the other way around, such as a sleeve started at the shoulder, and required to DECREASE to the wrist diameter as the sleeve is worked. Luckily, DEcreasing in seed stitch is exactly the same theory, except that you simply work two stitches TOGETHER at the required rate, rather than form an increase. It is a nice touch to employ symmetrical decreases such as the right leaning k2tog and the left leaning SSK (or the left-leaning SYTK). 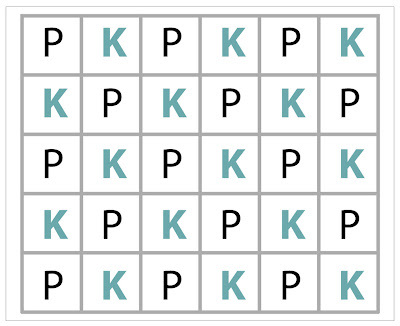 Once the excess stitch has been removed on either side of the center line, or on either edge of the row, continue to work the remaining stitches in checkerboard pattern as required by the surrounding stitches. Stated otherwise, the LOCATION of the decreases is the same as the location of the increases: if working circularly, one on either side of a center line of knits; if working back and forth, one decrease on each end of the indicated decrease row, one stitch in from the knit column(s) along each edge. When you get right down to it, this trick of shaping on either side of a column of knits is really just an adaptation of a method widely used in circular-knit raglan sweaters: if you have ever knit a raglan sweater in the round, this is the shaping which is done on either side of the 4 raglan seams, keeping the center column(s) in all-knits. The difference here is that the shaping (increasing or decreasing) is done in pattern of seed stitch, instead of stockinette, and the column of knits is used to disguise the stitch pattern discontinuity resulting from shaping. You have been reading TECHknitting blog on increasing in seed stitch, and decreasing in seed stitch, too! Here are some great links I've been saving up. Thanksgiving seemed the right time to share these. LibriVox--5000+ free audio recordings in the public domain: enjoy while knitting. 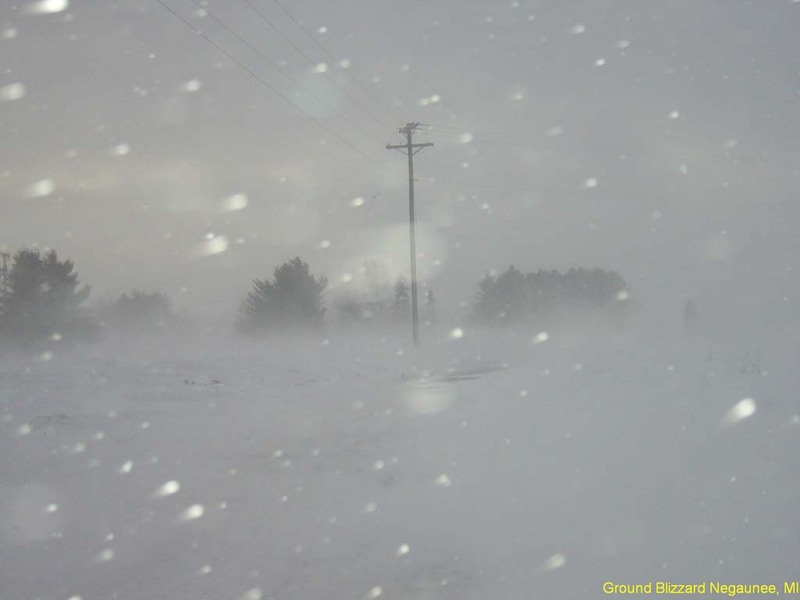 Two different strands wind through today's post, but never fear, they come together at the end. As they knit along, those old time knitters knew for sure they were making something valuable. Long ago people thought about their clothes much differently. In that society, people listed clothes in their estate inventories, or made made them part of their will. A nice pair of hand-knit stockings were worthy of being passed along as a special bequest for usefulness and remembrance. That attitude lasted a long time, too. When asked why she kept old clothes which no longer fit, my grandmother (born in Austria in 1902) used to reply with a German proverb that "clothes outlive their people." Today, clothes don't have that resonance. Clothes are not really considered valuable. That, too, is something I think about when knitting: after all, it takes a certain thickness of skin to be a confirmed hand-knitter in the day of cheap ready-made sweaters and expensive yarn. However difficult life was for the old-time knitters, the usefulness of their craft was never at issue. So, while we think about knitting's value while we knit, that's one thing with which the old-time knitters never had to concern themselves: clothes in that day were valuable and scarce. Another by-product of clothes not being considered valuable nowadays is that, when people pass on, it seems a bit creepy, almost, to keep their old clothes around. The old way of passing your clothes on to others hardly exists: those clothes are more likely to end up in the goodwill store than being worn around. And yet, hand-knitting, at least around here, recently broke this trend. 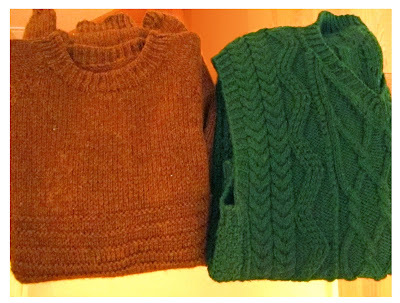 Here are a couple of sweaters I knit a long time ago for my father (brown sweater) and my stepfather (green vest). When both men passed on, I got the garments back. For years and years they sat in the cedar closet. I almost didn't bring the sweaters out of the closet, because I thought it would be kind of unsettling. 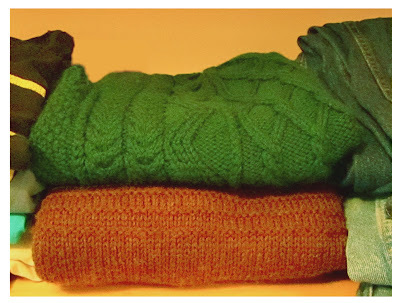 Instead, the sight of those old sweaters given a new life turns out to be a sort of relief. I feel like I can think about their original owners again without the first thought being "oh! they're both dead now." For one thing, I have to remember just how small both my father and stepfather really were, when I see the kid running around in their old sweaters. When these two old sweaters escaped from the cedar closet to sit on the shelf with the every-day clothes, they turned out to be something valuable, like something made by the old-time knitters: a glimpse of my family's past as well a glimpse of the textile-past, both brought to life. Further, I now know something about the old time knitters and their thoughts which I didn't know before. When we knit, we think a lot about the person we are knitting for. But when they knit, the long ago knitters were making making a garment independent, in a certain way, of the person for whom it was knit. I mean, I'm sure they thought about the sweater-recipient, but they also expected that the garment would be passed along when the recipient had no further need of it; not gotten rid of, or stuck in a cedar-closet jail of remembrance. Something new to think about while I knit, I guess. A recent post on Ravelry showed the problem with discontinuous rounds of color knitting against a solid background. Color knitting in the round forms a spiral. 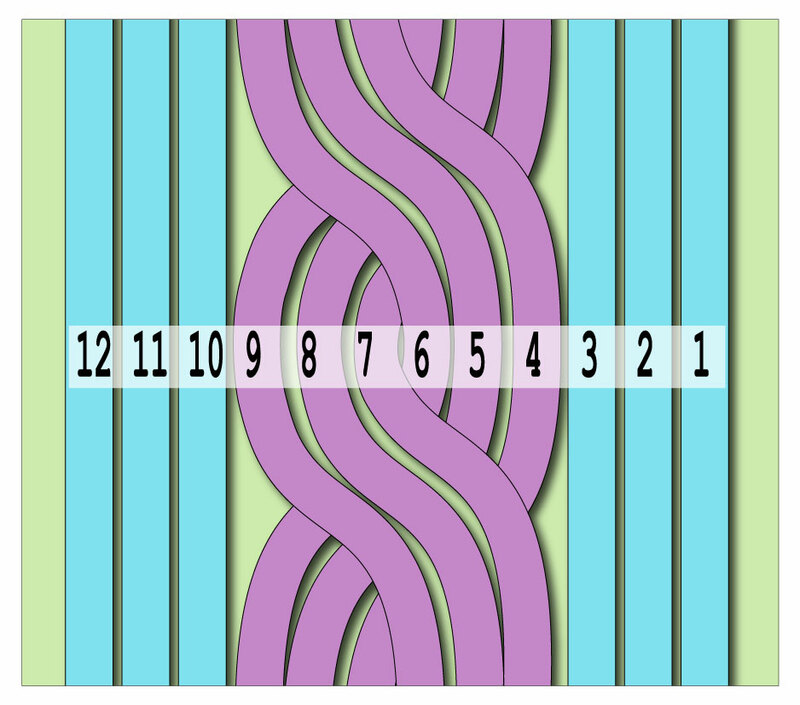 Therefore, the end of each round is 1 stitch above the beginning of that same round, forming an unattractive "jog." 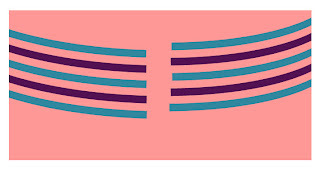 However, although both the jogless stripe trick and the helix stripe trick are nifty tricks that really work, they have their limitations. Specifically, where the colors are one round or more rounds high, but AREN'T CONTINUOUS, neither jogless nor helix will work. 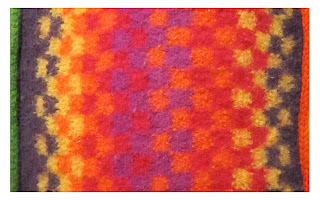 The most common example of non-continuous stripes are one-stitch high stripes in different colors: Fair-Isle knitting is a subset of that category, since each motif is typically made up of single-stitch-high color changing rounds. Traditionally in Fair Isle-type knitting, the color jog wasn't hidden, but was placed as far out of sight as possible: under the left arm. A different traditional treatment was to center the color change dab smack in the middle of the sweater front, and then cut the sweater (called "steeking") up the discontinuity. (For those unfamiliar, a steek is secured by sewing before cutting, then the front bands are put on either side of the cut afterwards.) 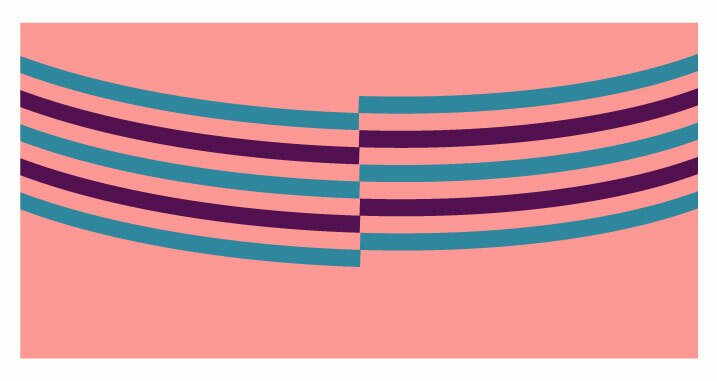 Putting the color change at the steek separates the offset by the width of the front bands, making it indiscernible. A third trick, not much known, is called "picture framing." 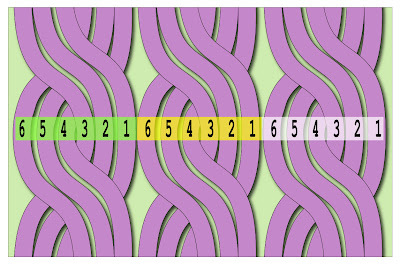 By this trick, the patterns forming color-stripes are purposely kept apart by a few columns of either an added color, or a few background-colored stitches, as shown below. 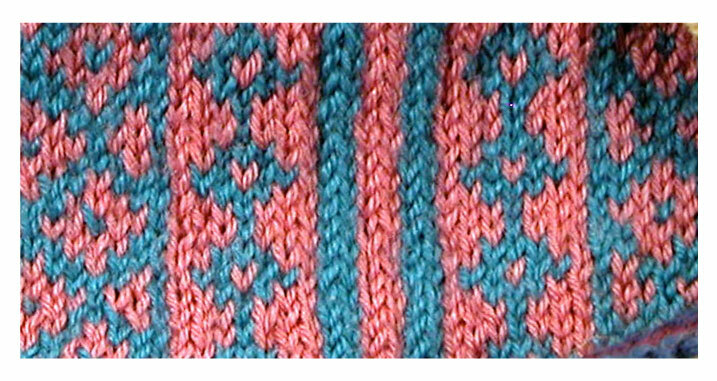 Any Fair-Isle (or any other kind of colorwork) sweater can be adapted by picture-framing: you just add a few columns (stitches) to the pattern and always knit those stitches in the frame-color. 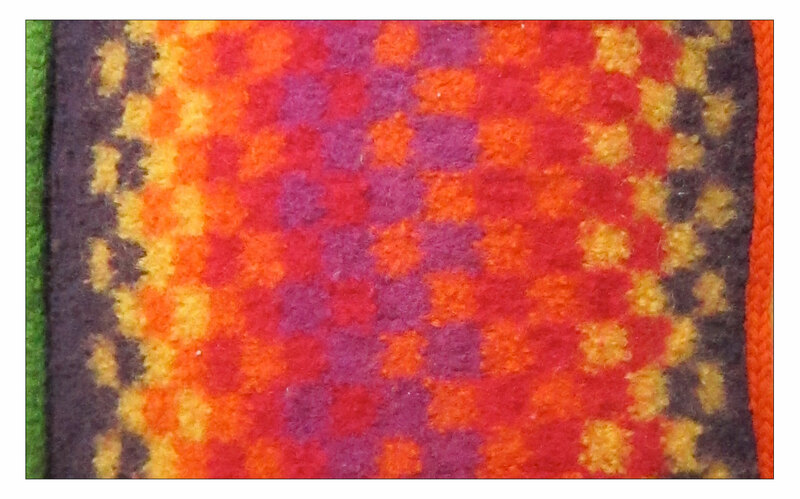 Here is a real life example of picture-framing on the side seam of a Fair-Isle inspired garment. 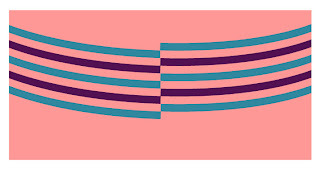 This frame is quite a bit more complicated than the simple background-colored vertical stripe shown in the line drawings above, but follows from the same idea. As for the how to, you can carry the yarn frame color along, up the columns by winding it into a small butterfly or bobbin and keep that hanging on-site (don't carry it around the round). When you get to the frame, draw the running yarn from the bobbin back to the starting point and knit the frame columns with it. The other colors are simply stranded behind the picture frame columns, every time you come to them. Alternatively, if the same colors are always used in the frame as in the main body of the work, as in the photo above, you can just knit the frame as part of the ordinary colorwork. Obviously, if you make a very wide frame, this will make something of a welt (raised ridge) at the frame, because of the stranding yarn behind the columns of the frame. However, over a short span (2 or 3 or even 4 stitches) maintaining a loose tension will generally avoid the welting problem. In the comments, Beverly mentions a pair of socks she designed which feature picture framing separating patterned panels from one another. 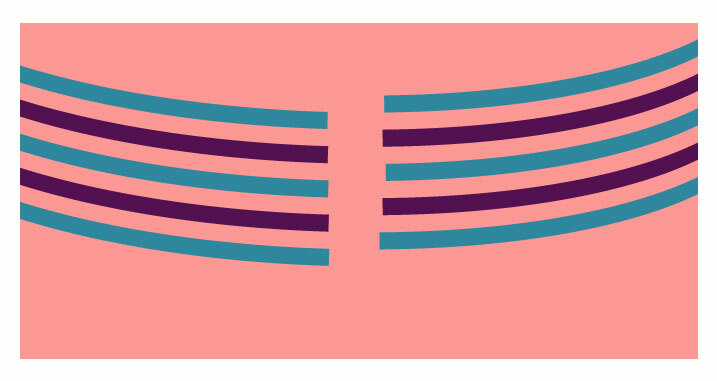 These socks are a good example of using simple background-color picture framing to avoid a pattern jog, go have a look. Also, have a look at this beautiful Faroese sweater by Asplund, a very talented knitter. Asplund has used picture framing at the sides of his sweater, and has even carried the framing right up the arm-seam, also. Beautiful. You have been reading TECHknitting on "how to avoid a jog in Fair-Isle knitting"
Felting knitting, or "what's in a name?" Some call it fulling, and that's probably the most technically correct. Some call it "boiled wool," and you can certainly boil it, but you don't have to. I think most people call it felting, so I will too. Felting has two sides to its nature: the utility aspect, and beauty inherent in such a dense fabric. 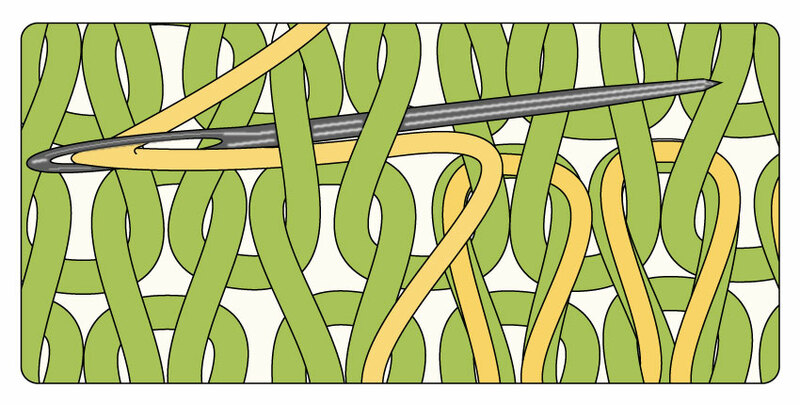 Felt is as close to a miracle fiber as you can make outside of a lab. It is somewhat rain-proof, somewhat wind-proof, immensely warm and very hard-wearing--nomads in some of the world's coldest places live in felt huts, dress themselves in felted hats and shoes and use felt saddle cloths on their horses. 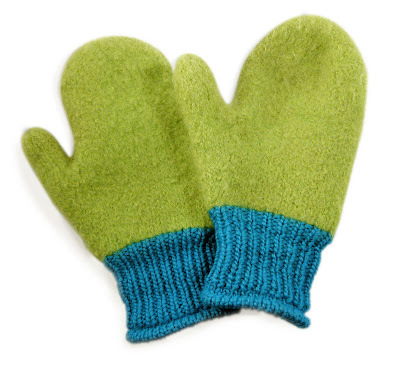 Closer to home, my kids have worn felted mittens here in Wisconsin for years: here is the same pair as shown in the opening illustration after they were worn for two years by a little boy for snowball fights, sledding and all-around tom-foolery. An unfelted mitten would never have survived, but these are tucked away safe, waiting for another little kid who needs bomb-proof mittens. However, utility knits aren't the only reason to felt. Felting is inherent beautiful with a soft, lush look. The stitches lose definition and meld together, the surface becomes matte. Here is a peek at the fabric of a felted cushion. The density of the fabric not only makes it wear hard, but makes it almost luminous--the depth of the fabric reacts with light differently than a thinner or smoother or shinier fabric would, the colors seem more saturated. Of all the cushions we have in the house, this is the one that people find themselves holding and carrying around from place to place. Felting is an irreversible process. Once felted, a hand knit garment cannot be unraveled. The yarn has stuck to itself and congealed into a solid mass. This irreversibility has both downside and upside. On the downside, that beautiful hand knit which went into the washing machine by accident has been ruined, yes. Nothing--not vinegar, not yogurt, not shampoo, not conditioner--can bring it back to its pre-felted state. On the upside, it is the very irreversibility of the process that makes felted items so hard-wearing. Felted knitting can be cut, sewn and shaped. It will not unravel, so a felted sweater can have a long and lovely second act cut up and sewn into cozy mittens and slippers. Besides being irreversible, felting is also unpredictable. Sometimes, felting occurs gradually and evenly across an entire garment. More often, the process occurs suddenly and unevenly. Accordingly, felting garments to fit is something of a gamble. It is true that felted garments are available for sale--"boiled wool" jackets are a famous example. However, these garments are made from sheets of knitting which has been felted and then cut and sewn. The jackets are not "boiled," the fabric is. For this reason, most knit-and-felt patterns are for bags, or mittens, or slippers: items where the fit isn't super-important. The two main ways to felt are by hand, or using a washing machine. Two other methods are by using a (clean!) toilet-plunger or by using a dryer. 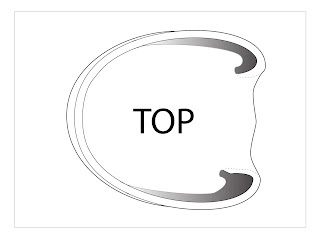 Whichever way you choose, however, consider turning the item inside out first, because the exposed side can get a bit roughed up by the process. With hand-felting, you have more control over the project. The mittens in the photo above were stopped from felting further at just the right time by having a paper pattern handy, against which the mittens were frequently compared as the size got nearer and nearer. For larger projects, or for projects where fit is not so much of an issue, felting in the washing machine is a good choice. Felting a large project by hand makes you realize the immense strength that the old washer-women must have had, to wrestle wet and heavy fabrics by hand. First, prepare a basin with cold water, and another with hot water, as hot as you can stand. (Hint: wearing dishwashing gloves lets you use far hotter water than you could stand without them.) Wet the item to be felted in the hot water, then lift it out of the water and rub and knead a drop or two of dish detergent through it. Hold one part of the item in one hand and the other part in the other hand, and rub the item on itself, changing your grip frequently to bring new parts into the process. Rubbing evenly all over gets the best all-over felting. 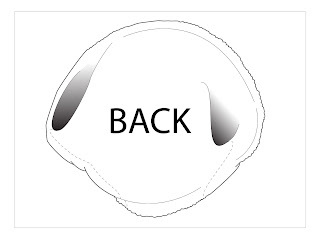 Dunk the item into the hot water again, and begin to wash the detergent out, then abruptly dunk the item in the cold water and continue kneading and rubbing. Again lift the item out of the water, add a drop or two of detergent, then agitate and rub for a while. Continue in the manner, alternating sudsy kneading under hot and cold shocks until the item is the size you want. The felting and shrinking usually occurs when the cold water shocks the wool, although it sometimes occurs on a hot-water shock. Sometimes glove fingers or mitten thumbs fingers might try and felt shut. Keep a wooden-spoon handle or chopstick handy to poke apart unwanted interior felting. If you want to try boiling, dunk the project into a pot of boiling water , stir it with a wooden spoon, dunk it back in the cold water and do the soap and agitation cold. Repeat. One thing about boiling is that dyes used on woolens aren't always benign. Be sure to wash the pot very thoroughly afterwards, and use only a stainless steel pot to avoid unwanted interaction of the pot-metal with the dyes. However you do it, this process sometimes takes a LOT longer than you think, and you might have to replace the hot water with fresh if it gets too cool. 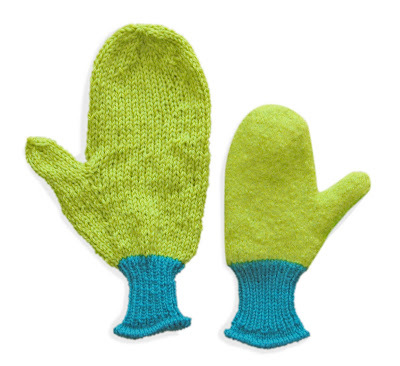 Depending on the color and type of wool, it has taken me as long as 20 minutes of constant agitation and temperature shocks to felt one measly mitten. Other times, however, the process takes place so fast you can hardly see it happening. If it is taking a while, take heart: although you may doubt it while you are wrestling away, as long as the item was knit with ordinary wool (NOT SUPERWASH!!!) it will eventually shrink. When the item is the size you want, stop rubbing. Let the item come to room temperature, then gently rinse out the suds in fresh lukewarm water, then lay flat to dry out of the sun. The easiest machine for felting in an old-fashioned top loader you can stop in mid cycle. This lets you haul out the wet item to test the size as the process progresses. These old top-loaders also let you re-position stuff--sometimes items to be felted get folded on themselves during the spin cycle, and the marks left behind can be hard to get rid of. Another advantage is that, on most top-loaders, you can change the cycle with the twist of a dial, easily switching from wash to rinse to spin. Yet another advantage is that you can keep cleaning the lint screen if your project sheds. Top loaders do have one important downside, though: believe it or not, a washing machine agitator can break your arm. Be sure the machine is turned OFF before you reach in. Felting can also be done with a front-loader. These machines lock and it is often difficult to change the pre-set program once its started, so to get around this, choose the shortest cycle. This lets you keep checking the size after each run-through. The principles of felting are the same whether by hand or machine: lots of temperature changes, lots of agitation. Each machine has different settings, so look for a heavy-duty cycle (lots of agitation) with abrupt temperature changes (hot wash followed by cold rinse, or vice versa). Unless the item is massive, it probably makes more sense to toss your felting in with a compatible load (or loads!) you were planning to run anyway. Some people prefer to run the item through the washer in a mesh bag or a pillow case. This does help catch the fibers from the wool, but has the downside that the fibers may be re-deposited on the surface of the item. Nevertheless, if your machine is elderly or likely to get clogged from a particularly wooly project, a bag is probably a good idea. If you are using a method where you can't get at the item during the felting process (the item is in a pillow case or a mesh bag, or if you are using a front loader which can't be stopped) you might want to consider stuffing the project loosely with a small rag. 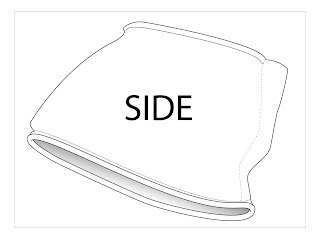 This helps keep the item from folding over on itself inside the bag or during the spin cycle: folding can leave crease marks. 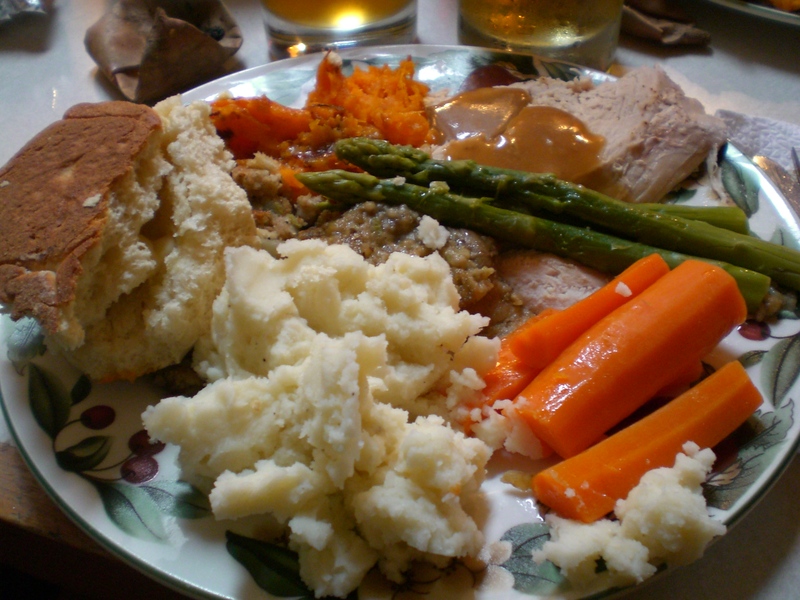 For small items, a loose stuffing can also help prevent the item from starting to felt to itself. A toilet plunger offers yet another way to felt. Yes, this sounds d.i.s.g.u.s.t.i.n.g, and so it would be if you used the same plunger for felting as for your toilet. Yuk. Don't do that. Buy a brand new toilet plunger and hide it away when you're not felting. Fill the tub with hot water, and the bathroom sink with cold water and have at it with the plunger. This is more work that machine felting but less work than hand-felting. Plus, unlike front-loader felting, with a toilet plunger, you can stop at any time to check the project. You can also felt hand knits, sort of, in a dryer. You put in the wet item (turn it inside out) and the dryer does the temperature change and agitation part. The upside of this is that you can stop the dryer at any time and have a look, the downside is that it often takes multiple wetting/drying cycles to get a moderate amount of felting: the temperature change is gradual, and the agitation less than if the item were in water. This will eventually work, but it's slow, and even slower if you put it into a bag or pillow case. Just because something is felted doesn't mean it won't shrink if you wash it again. The upside is that if the item is still too big, you can re-felt it. But if you'd like the felted item to retain its size, wash it the same way you would wash all woolens: cool water, no agitation, no temperature shocks, and no dryer. On the other hand, felt doesn't really seem to get very dirty--to my recollection, I've never actually had to wash a pair of felted mittens. There is something about felted wool which pairs well with embroidery. 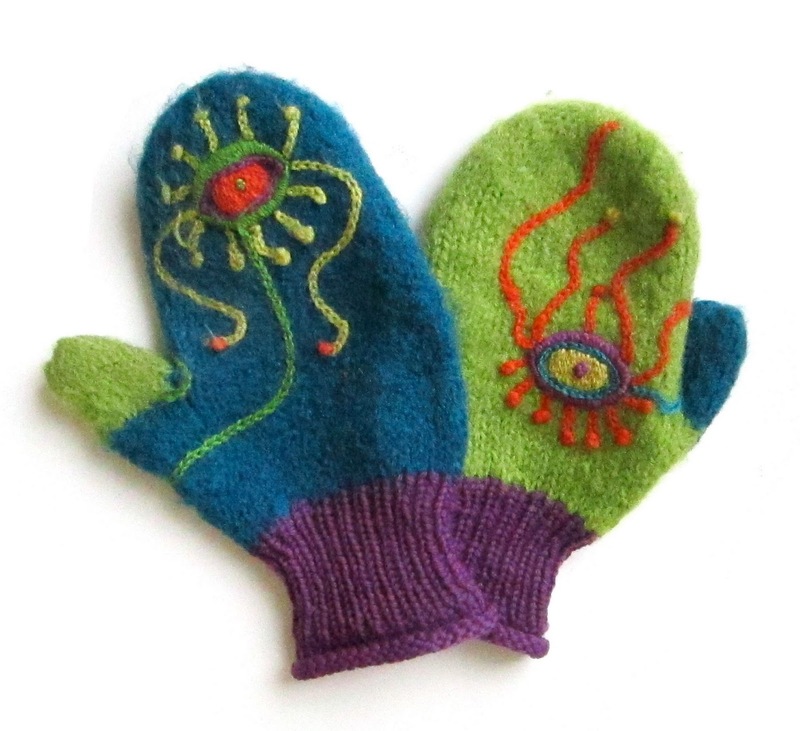 Below are some "alien eyeball" mittens (also much worn) which were embroidered after felting with a sharp needle and woolen (called "tapestry") yarn. Although there are exceptions, knitting generally doesn't play well with embroidery because the embroidery sinks into the stitches. However, felted knitting has no such problem. 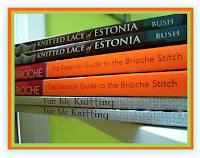 You have been reading TECHknitting on "felting knitting." Every single one of these is a great invention, a monument to human ingenuity. Yet, when I go to cast on or bind off, the technique I use more than any other is the simple rolled edge. This edge can take it--hats and mittens go through three kids and the edge still looks good. Socks last until the heels wear out. The main thing, though, is that it Could.Not.Be.Easier. Step 1: cast on any way you like: long-tail, cable cast on, literally any method at all. The only thing is make it LOOSE. Much looser than you think. Use larger needles if you need to. Step 2: switch to the needles you'll use for the ribbing and make the rolled edge by working several rows or rounds of stockinette. Step 3: start your ribbing. For bind off, reverse: work several rows or rounds of stockinette, then bind off any way you like. Just make it LOOSE. Bonus points: bind off and cast on match. The stockinette rolls over, hides the edge, wears like iron, never binds. 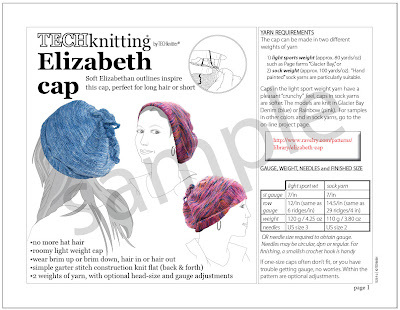 The TECHknitting pattern is now available for Elizabeth Cap. The pattern is 7 pages long and includes tutorials on two kinds of garter stitch selvedges and picking up stitches, as well as written instructions plus schematics for the project. Inspired by the soft flattering caps worn by women for hundreds of years, the cap is worked in modular sections. 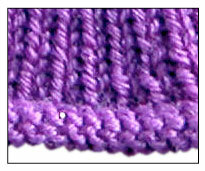 The cap is all flat-knit (back and forth) in garter stitch, and was designed especially for "hand painted" yarns. Gauge and yarn info are on the cover shown below (click image to enlarge). "...I'll be especially interested to read about your process." Which got me thinking backwards and thus begat today's post. The drive for every knitting project comes from a different place, I think. Sometimes, the project is product-driven ("I need a red sweater for the Christmas party"). Sometimes, the project is process-driven ("I love knitting cables"). Often, a couple of drives collide ("I'll knit a red cable sweater!") But this particular project, this cap, was mostly yarn-driven. As stated in the last post, I was away from knitting for a long time. Oh, I did keep knitting the occasional project, but mostly on yarn I had laying around. When I sold my yarn shop, I held back a *bunch* of my favorite yarn--for years, yarn shopping was unnecessary. When the long drought was over, yarn shops were full of all kinds of new yarn. Gone were the old standards (sniff, Brunswick Germantown, RIP). In their place were new! exciting! yarns! Among these new yarns were "hand painted." These looked excellent in the skein, but when knit up in stockinette, they seemed odd and splotchy. Yet, the colors were intriguing and inspired, so I kept trying. Texture work was a flop--knitting cables and other textures in these yarns was a waste of energy. The textures were nearly invisible against the surging colors. Lace work was a flop--the repetitive patterns which make lace inserts so attractive were disrupted by the non-repetitive color placement. The variations-on-a-theme which anchor the most beautiful lace projects were equally lost. What the heck was that yarn trying to be? Not stockinette, not cables, not lace inserts, not lace projects, so what? It bugged me for a long time. Of course, by this time, I had a bunch of this kind of yarn laying around. So, one day, just to use up the yarn, I made a pair of socks in stockinette, with garter stitch heels. Well! The heel was everything the rest of the sock was not--the socks were splotchy, the heels were beautiful strips of color. The "heads" of the stitches alternating down the length of the garter ridges made dots of contrasting color all the way down the row, so the colors worked together in the fabric in the same way they worked in the skein. Finally. Hallelujah. containing as much reserve yarn as it does, garter-stitch fabric is stretchy and unstable lengthwise. In other words, garter stitch wants to stretch and stretch and stretch when it is worn, as those angled stitches get dragged straighter and straighter through wear and gravity. Harnessed in a good way, this is excellent. For one example, garter stitch jackets made for children almost magically grow with their wearers, and this a really swell thing for little people. But for grownups, not so much. because of the amount of yarn it takes, garter stitch is s-l-o-w to knit, which translates into b-o-r-i-n-g. The constraints were clear. The project must be small; stretch must be wanted, but not so much that the garment became misshapen; and the yarn used be of a light weight, so that stretch and distortion could be combated by knitting more tightly.So, that was one train coming down the track--the need to find a project in which hand painted yarn of a light weight could be knit up in garter stitch. Coming down the track in the other direction was the perennial train of necessity, here in the upper Midwest, to find a winter hat. The ideal hat would not create hat-hair and would not pin one's ears to one's head so that they ached after a short time. Versatility would be a good thing, too: the choice to wear hair in, or hair out, and for the hat to be light enough to store in a pocket until needed. Eventually, these two trains got switched onto the same track when I sat down to knit the nth winter hat of my career, using some light-weight hand-painted yarn knit in garter stitch. This little cap emerged after several experiments in adding ease over the ears and over the cap back, but not over the front of the cap. 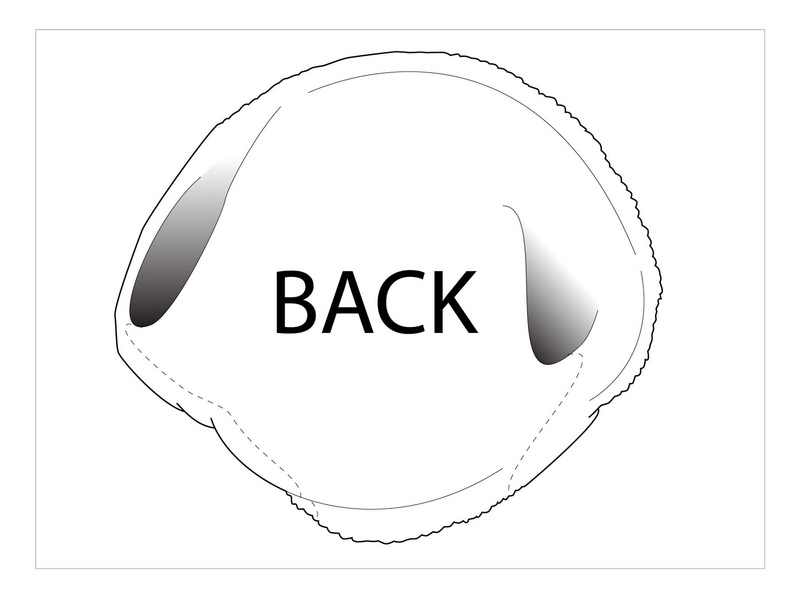 The final profile owes a lot to Elizabethan-era caps, which led to the name "Elizabeth cap." After all, Elizabethan women were required by custom to cover their hair at all times. They must, I thought, have figured out a comfortable, attractive solution. The yarn I chose, Pagewood Farms' Glacier Bay, has a lovely crunchy hand when firmly knit in garter stitch. Yet, the unfortunate reality is that Glacier Bay is not commonly available (although if you can find it, try it--it is a unique yarn, at a unique weight, and no, I am not related to the fine folks at Pagewood Farms in any way). So, I re-worked the cap in hand painted sock yarn, and that was satisfactory, also. I've made four of these so far, and they seem popular. This led me to write up the pattern (which will be available Thursday or Friday of this week). That's a lot of backstory to freight down such a little cap. But, it was fun to research and fun to write. It's also been fun to wear, and to knit a bunch of them, and it's been a trip down memory lane to write the pattern. In a nutshell, the process of designing this little project was letting the yarn be what wants to be. Many years ago, I owned a yarn shop. I taught lessons, wrote patterns and sold them and did the whole business thing. 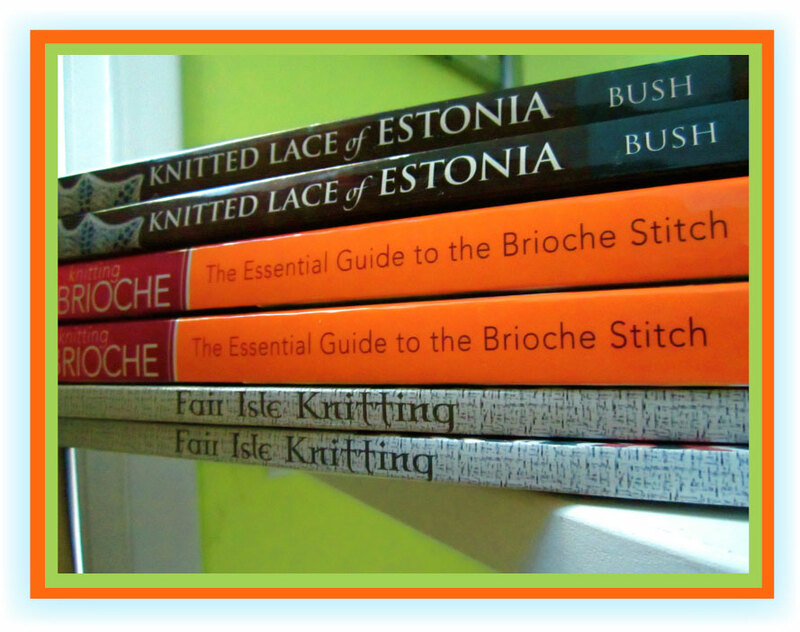 I even started a knitting book. Oh, I even taught myself Adobe Illustrator, in order to provide the illustrations (and LORD was that program S-L-O-W when it first came out). Anyhow, despite all the knitting stuff I loved, life got in the way, and I turned my hand to other things. There were times I wondered pretty severely how it was all going to turn out, and some times when I was pretty sure it wasn't going to turn out at all. However, with great good luck and all due humility, that non-knitting hiatus worked out OK. In the past few years, the 24/7 stuff has been gradually fading away, and I have able to find the spare moments to come back to knitting. One day in 2006, I was poking around the internet, and somehow found a knitting blog. Man, that was IT! I was hooked. Two days later, TECHknitting blog stated--I think it took me the whole two days to get the first post up. I was so excited, I don't think I slept. Ever since then, I've been using every spare minute for knitting and drawing and writing. And lately, the little voices in my head have been whispering to me that I really ought to go back to pattern writing. 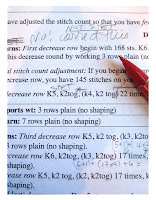 The last time I regularly wrote patterns, spread sheets hadn't yet become very popular. (I think the dinosaurs roaming around everywhere got in the way.) So, I learned to do pattern grading and gauge grading all by hand. Now that I've sat down to start pattern writing again, old habits die hard. I do the illustrations in Adobe Illustrator, I put the pattern together using Adobe InDesign, and know I could do the gauge grading in Excel, but here I am, writing patterns with paper and pencil. Go figure. 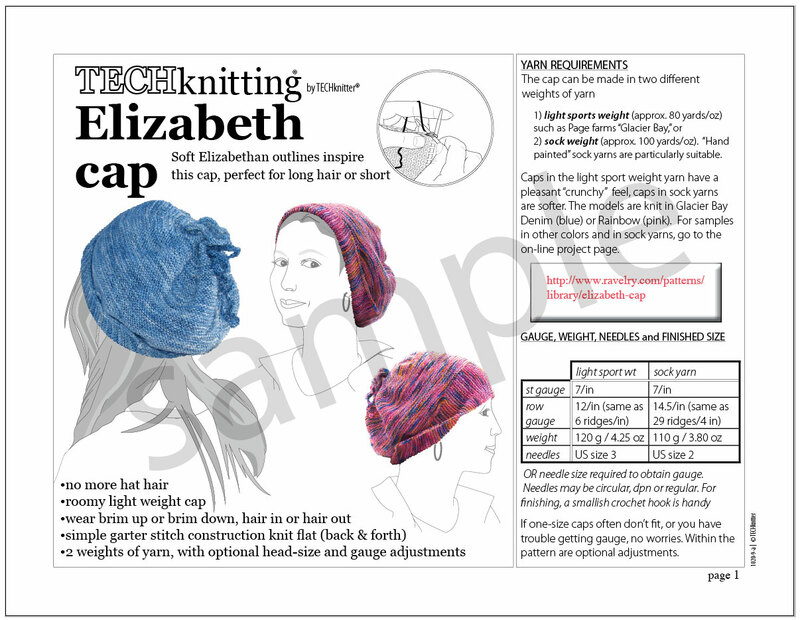 A new TECHknitting pattern is about to come out--a pattern for an Elizabethan-style cap--and I thought a peek behind the scenes at old-school pattern-writing might be interesting, in a time-capsule kind of way. The pattern will be for sale on Ravelry in about a week. It's no biggie, it's just a cap, but it is a new direction around chezTECH, a further return to the knitting business that I had to leave behind so long ago. How's this? "Cast on a multiple of 12 stitches plus 5." Or how about "pattern is a multiple of 9 stitches plus 3"? Does that sound horribly like high school algebra? Does it confuse you? If my e-mail is anything to go by, you are not alone. Suppose we are working a cable over 6 stitches. Another way of saying this is that the cable is a multiple of 6. For each cable we want to cast on, we have to have six stitches. That seems simple enough. But, if we only cast on 6 stitches, we'll have a cable, yes, but no fabric on either side. If we want, let's say, three cables, it would be awfully tight (and not that pretty) to have nothing but cables sitting right next to one another--here, see for yourself. So, let's set each cable against its own little patch of background fabric. In other words, we'll add a little fabric on each side of the cable to set it off, 3 purl columns, say. The original 6-stitch cable with its two new 3-stitch-wide side flaps is going to take up 12 stitches: 3+6+3. 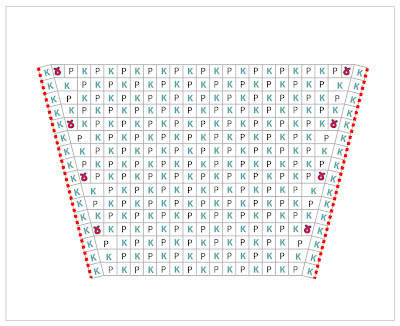 This LOOKS like we've developed a 12-stitch-wide stitch-pattern. 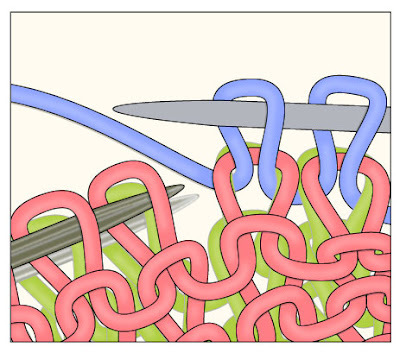 And, indeed, if we just wanted to make a skinny single cable scarf, we'd say "cast on 12 stitches." So far, so good. But, suppose we want a scarf with two cables. 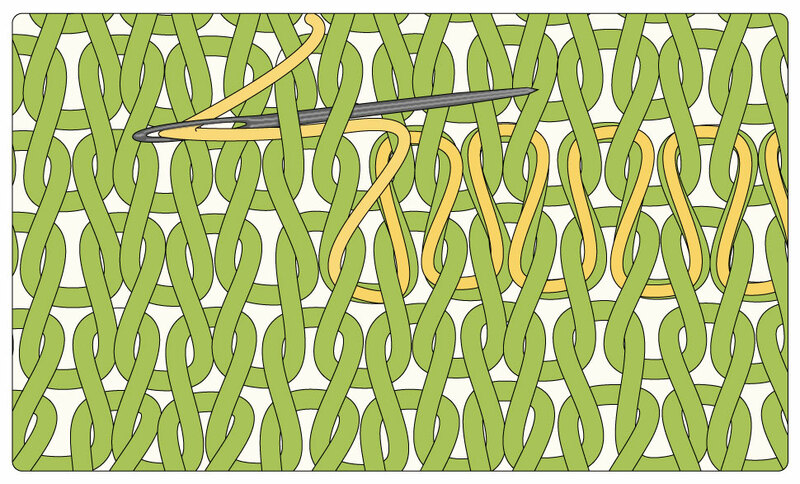 If we simply double the 12-stitch-wide stitch-pattern we've developed, we get trouble. As you can see, doubling twelve (casting on 24) means the cables aren't centered in the fabric. 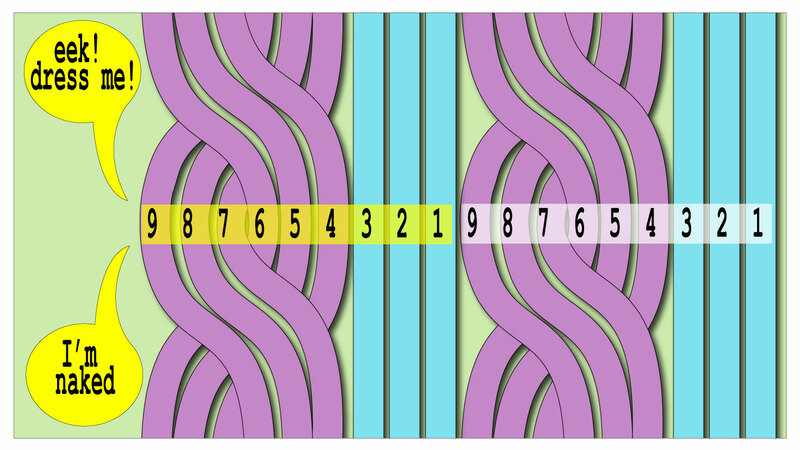 Instead of being framed on both sides by THREE columns of purls, the two cables are separated from one another by SIX columns of purls. Now the edge-columns are looking a little skimpy, the fabric is unbalanced, and the cable placement is not symmetrical. The problem, of course, is that we really only needed THREE purl columns between the two cables, not SIX. The three purl columns in the middle of the fabric ought to be SHARED between the cables. 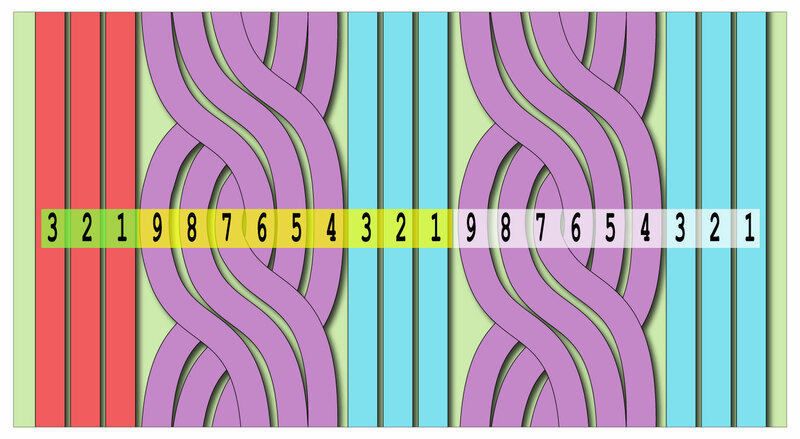 In order to share these columns, however, we're going to have to think about this stitch pattern in a different way. 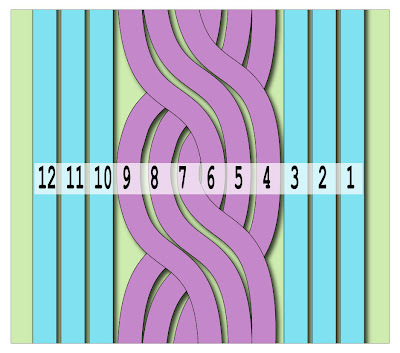 What if we think of this particular stitch pattern as being NINE stitches wide as shown above, instead of TWELVE stitches wide? When we stack up these nine-stitch-wide patterns side-by-side, we can see that the cables are sharing the center three purl columns just fine. Conceptualizing this as a nine-stitch-wide stitch pattern has certainly solved the problem of sharing the purl columns between the cables. Yet it clearly leaves us with a different problem. That second cable? The one to the left? It's naked on its left edge. We're going to have to add three more purl columns to complete the pattern repeat to the outer left edge. Now we're finally there: two 6-stitch-wide cables, each framed by 3 purl columns, and no naked knitting. 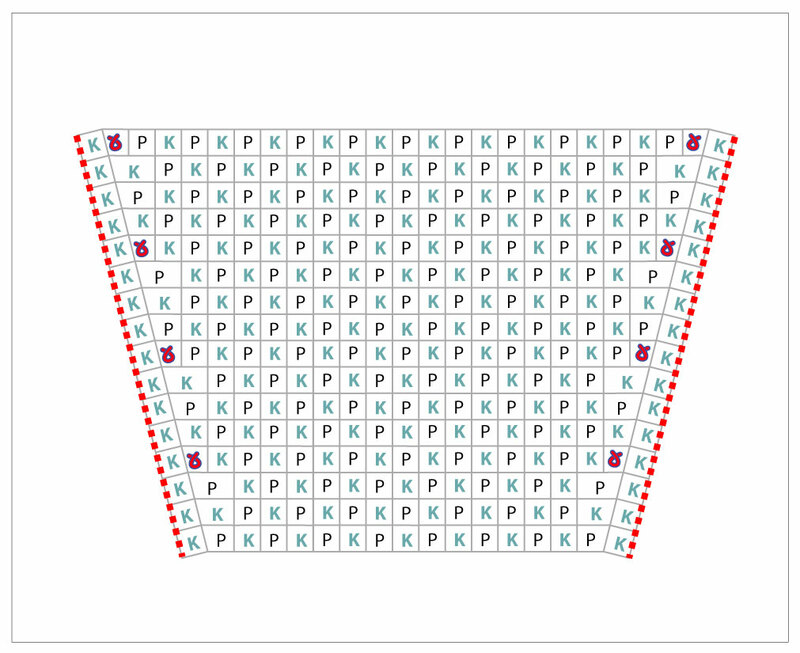 In fact, we have a pattern of two multiples of 9, plus the three red edge stitches we just added. 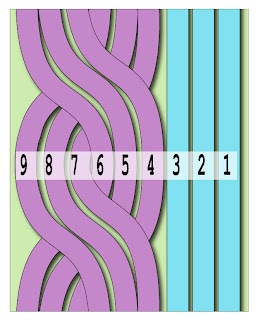 Our stitch pattern turns out to be a multiple of 9 plus 3. Stated otherwise, when we flanked our original 6 stitch cable with two 3-stitch-wide purl columns, we weren't developing a 12-stitch-wide pattern. It did have 12 stitches, true, but it was actually a pattern constructed of a single multiple of 9 stitches plus the 3 red edge stitches, as shown above. repeat of the pattern to the outer left edge. 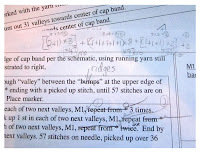 You have been reading TECHknitting blog on stitch pattern notation: "Multiple of x plus y." Margaret who wins "Knitted Lace of Estonia"
Astrante who wins "Knitting Brioche"
Jenny who wins "Fair Isle Knitting"
Congrats, thanks to all for commenting, and thanks for reading TECHknitting blog. Fall is coming. The cold-weather clothes are coming out. Here's a neat trick to get fix worn-out Uggs to get another year's wear out of them. This is not actually a knitting post but close enough--a trick with loose wool. 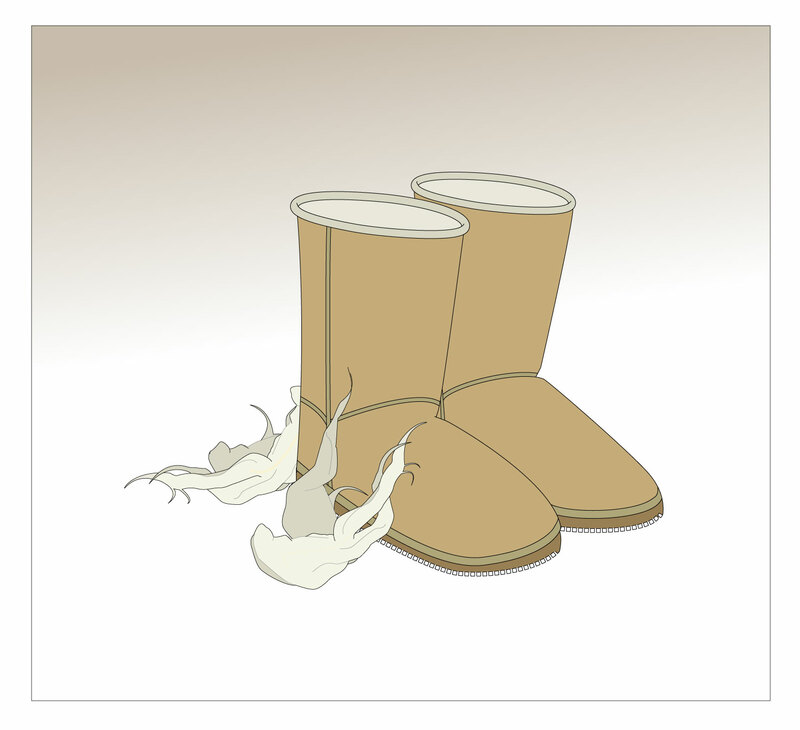 The thing with Uggs, heck, with all shearling boots, is that as time goes by, they start to wear out. First, the wool inside gets beaten down. Then, the leather tends to stretch with wear. So here's a (super) simple trick to refresh the innards of a well loved pair, and at the same time, tighten the fit to like-new. 1) obtain some loose wool--the kind of locks prepared for spinners (washed and combed) are perfect. However, pretty much any combed loose wool with vegetable matter and oils removed will do. 2. Slip some of this loose wool into your boots in small handfuls, trying to keep the strands of the fibers oriented in the the same direction. Insert your foot every handful or two, to test the fit, then keep going until things feel snug but not suffocating. Put the wool more around the edges of the foot, and don't put as much under the foot as you think--too much loose wool under the sole tends to clump up and get hard to walk on. As you walk around, the wool inside will mold to your foot. It is best to wear your Uggs barefoot with this trick, or the loose wool will stick to your socks and make a mess. If you must wear socks, wear thin light-colored smooth cotton ones, *not* woolen. As to the exactly best kind of wool to use, my own method has not been very scientific--I just grab a small bag of loose wool at a farmer's market whenever it comes up for sale, so I can't tell you what kinds are best. It does seem, however, that different batches of stuffing-wool last for different amounts of time. Perhaps someone more knowledgeable will speak up in the comments as to what would be a specific kind of wool to look for? At any rate, when this new wool has become too trodden down--overly felted and worn, its easily removed and replaced with fresh. Neat, huh? Not a new idea, though--this is actually a trick from the Middle Ages. This is how folks kept their feet dry and warm in all manner of clunky footwear--wooden shoes and heavy boots. This is also how the fit was adjusted on the coarsely-sized footwear then made. Wool was used if available, but really poor folks used straw (ouch!) or moss. Note: the below contest is now closed. Thanks for participating. The other day, while reorganizing books in my studio, I realized I was seeing double. Although a big fan (huge!) of all three books, I have no use for an extra copy of each. So, to thank you for being readers of TECHknitting blog, three lucky commenters will be chosen, each to receive one of the (lightly used) duplicates. Love the author's writing style? Lays flat when you open it? Good graphic design (layout of the contents)? 1. The whole process is going to be random: Three winners will be randomly chosen, and each of the three winners will randomly be assigned to win one or another of the three books available to be won. 2. A non-US winner would be responsible for any customs tax or fee incurred by receiving the book. 3. The entries will be closed at 12 noon, Monday October 17, CDT, and the winners will be announced shortly thereafter.